It's not long now until November, which means the first batch of DLC for Mario Kart 8 will arrive. As it's The Legend of Zelda x Mario Kart 8 and will include Link as a playable character, there's understandable hype. The recent reveal of The Master Cycle naturally grabbed our attention, then, a rather slick bike that resembles Epona. Eiji Aonuma has now shared his views on it through Miiverse, revealing a little about how it'll ride and making a slightly startling admission. His reference to wanting to use it is likely to have Legend of Zelda fans dreaming, or possibly dreading, the implications. Naturally, Aonuma-san's desire and admiration for the design doesn't mean it'll actually happen, but the talk of a Zelda game with a fresh, potentially futuristic setting will return; it's something that the famous series producer has spoken about in the past. Let us know what you think of the Master Cycle and Aonuma-san's comments below. 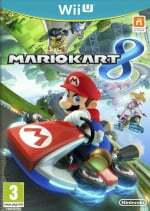 Mario Kart 8? More like Krossover Kart. "It looked so cool that I also want it to appear in games I work on." Dang! That could mean it just turns up as a picture on Link's wall ala Majora's Mask in ALBW & not an actual rideable bike. In terms if popularity, Capn Falcon Mii + Blue Falcon > Link + Mastercycle when the DLC arrives. I'm calling it now. Just make sure it fits in the environment and we're good, k? Don't get your hopes up. I highly doubt he would actually do that. Unless the Zelda franchise got a racing series like Mario. YES PLEASE. "It looked so cool that I also want it to appear in games I work on." Isn't the title of the article misleading, since he doesn't say it's a Zelda game? Aonuma could be working with other titles. Maybe not Zelda, but I'd definitely be interested in seeing Mr. Aonuma direct an open world futuristic action/adventure game with motorcycles. Since finishing Deus Ex: Human Revolution, I've been waiting to see another great game with a neo-noir, cyberpunk feel. I like that they call the bike Eponator in Germany, instead of Master Cycle. I want the next Mario Kart 8 DLC pack to have Batman in it so I can ride the Batpod from The Dark Knight. Hey, far more humiliating things have been done to Batman. Link to futuristic past in the Zelda U confirmed!!! I think the dismal sales numbers for Hyrule Warriors have pretty much guaranteed that they will not be taking any major risks with the main series anytime soon. I think that sales of a Dynasty Warriors game has no effect on Zeldas development whatsoever. I could kinda see Legend of Zelda going steampunk.....or kind of like Legend of Korra. There would be technology but it wouldn't be overbearing. You mean back? Zelda series are usually set long after technology has faded. A Zelda game set in the Future would be a dream come true. Well, we already had a steam train, i dont know why people are so put off by a cyberpunk/steampunk looking motorcycl ? So yeah, when Spirit Tracks worked, why shouldnt it work too ? Rolling Gorons, Kotake and Koume on Broomsticks, the running Mailman etc. Aonuma basically just wants to see the reactions of people on the internet about this, presumingly to get an idea of what fans think of such a concept. Well I say, if you can pull off adding futuristic (modern) vehicles or elements like this, and not just senselessly throwing them in there, then go for it I think it might be interesting to see, but more importantly, it should integrate into the overall gameplay and story of LoZ. But for now, keep it traditional. I'm downloading this for sure! Can't wait. I mean, if the setting suits it, then sure. I've always been curious about how Zelda might be handles in a futuristic version of Hyrule. Would they go dystopian or more like a medieval-ish future, where guns never became a thing? I want more of that timeshift stuff. It is one of my favorite mechanics in games ever. I like how people are immediately disqualifying the idea of it being used in a Zelda game without imagining the context or looking at Nintendo's excellent track record for game quality. I trust Aonuma's creative direction, and if he puts the bike in a future Zelda game, I'm sure it'll work out fine. If he doesn't, I'm sure it'll work out fine too. This is why Nintendo can't take risks in their main franchises; people shoot them down for thinking outside the box. And then after getting so much unnecessary hate, Nintendo delivers an incredible product (See Wind Waker or Metroid Prime). 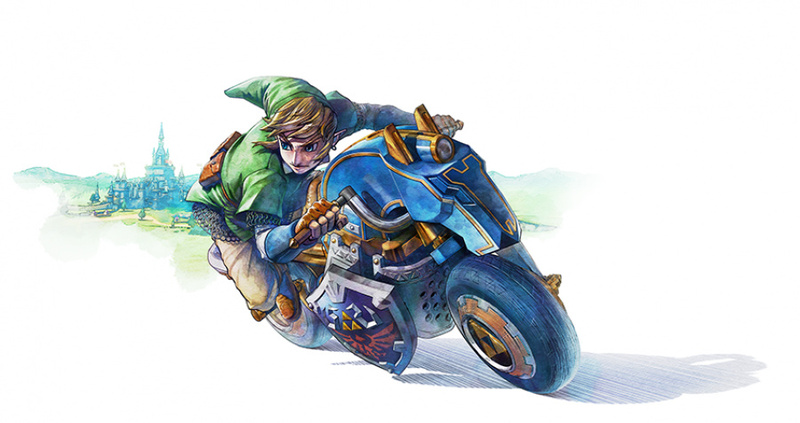 Maybe if it were a foot-powered cycle rather than a motorbike, it would fit more into the Zelda world. Doesn't the new Wii U zelda game looks futuristic ... in a still traditional way ? So we now know the name of the new Zelda.Zelda Kart U.
Argh! Don't praise this, Aonuma! Bad Aonuma, bad! But as long as he has a good explanation and usage for it, Aonuma should go right ahead and include mechanical vehicles in Zelda games. Motorcycle stuff worked in Kid Icarus Uprising, as well. A Zelda game set in a post Industrial fallout period where nature has reclaimed large amounts of the land would be awesome. Driving a bike through flowering ruins and vast countryside fields would be very cool. The Desert region of Skyward Sword could have easily had this technology if the space was there. Thinking of the new Zelda's trailer, I actually could see this fitting. There is that cool bow and arrow set plus the monster is actually a machine. I wouldn't be surprised if the new installment either chronicles a Hyrule at the peak of its civilization much like an Atlantis (remember, it even ends up at the bottom of the ocean!) or a sort of new history cycle after the fall of our own like in Secret if Mana. @drewb0203 How about Mario x Zelda Kart? That would be crazy. It would probably have a feel of zelda meets final fantasy 7. It could be an interesting departure, as long as zelda came back to its midevilish roots. Would be neat. It's different to the normal Zelda series, so they should be careful. Then again, people won't like it because most people hate change. I request the Master Cycle / Eponator for F-Zero U !! So it's inside drifting? Nice! I want Aonuma to stop working on Zelda. He doesn't even realize why the Master Cycle fits in Mario Kart 8 but not in the Zelda world. If Aonuma's allowed to continue, he'll make the "Final Fantasy 13" of the Zelda series. @Mahe Quit worrying about it, I'm pretty sure Aonuma knows what works and doesn't work for Zelda at this point. If he wants to experiment, let him. Zelda as a franchise needs to evolve to stay relevant, and sometimes the most unexpected idea could be the greatest. Truth is, the fans don't always know what's best for the franchise and if they had control of it they'd probably kill it. Besides, all he did was express interest in the idea, doesn't mean he's actually gonna do it. Calm down. Err..no, thanks. One cycle (the Zelda cycle) is enough for the series. The bike is completely within the realm of Zelda. Especially when you consider Lanayruian technology. It would simply be made of the same stuff as Scrapper and the other bulky tech of his age. Fans acting so picky about how they think the game needs to be like. Aonuma was probably joking but he can do whatever he wants with his own games. Maybe Zelda Wii U is one game. Then, maybe Aonuma would make Zelda Wii U 2, and this other title will be futuristic and Link gets to ride this bike. Two Zelda games for Wii U, would be awesome! Watch it be DLC content for the next zelda game... Watch. (sheesh) What is it with you guys getting so uptight about this? Call of Zelda: Biker Gang Ops. "We want big changes on the Zelda formula"
Aounuma: "Well, I like the MK8 Master Cycle, I could put it in future Zelda games"
Considering the futuristic weaponry shown in Zelda U, it's entirely possible for this to be a thing. I, for one, would love to see a futuristic Legend of Zelda. If Link is truly "The Hero of Time", I don't see why having the Master Cycle possibly show up in a new Zelda title would be a bad thing. Like someone's said earlier, if it's not just thrown in there for no reason, it'll be exciting to see. The GameCube got Wind Waker and (kind of) Twilight Princess..
Heck, even the NES got The Legend of Zelda and Zelda II. If the Wii U goes on long enough, I don't see why it wouldn't get a second (or third if you count Wind Waker HD) Zelda title. I don't think he was being literal...he said something similar about the cut-scenes in HW. I really like the HW cut-scenes though so I wouldn't be opposed Zelda has always had really well done emotive scenes but something about HW struck a chord with me. Anyway, praising the cycle design or not if Aonuma puts it in the game you all know he isn't just going to drop it in there randomly. So lets just chill out until the E3 footage? Eh, it looks nice, but I'd only want it in a game if it were a natural progression ideas. If they built a game world just around fitting that bike in, I'd be sick. Also, how the heck does the front wheel turn? @AJ_Lethal: Either you're observing two separate vocal groups or taking that phrase out of its intended context. The Zelda fanbase is incredibly diverse and will want different things from the franchise. One group of people may be wanting change to the formula and a completely separate group may want for the games to remain the same. People are more likely to make a comment about why they like something that why they do. What you see is one group being vocal about an issue they see and then another group being vocal about something they find to be an issue. You're also taking the definition of "formula" out of it's typical context. Typically in formula discussions, people are discussing that the gameplay is too similar. People can want the gameplay of Zelda to undergo a noticeable change, but to keep the roots of the series more intact. I called it! I totally called that one! Everytime this.....dude, speaks iditic pr condescending things come from it. Then fanboys will clap like seals..
and the game, again, has mediocre sales..
then aounuma will cry or something while wipping his tears with his hoodie under his suit..
and fanboys will be angry and blame "the filthy casuals!!!" and cry "but but it has a metacritic score of 500!" because they still believe that scores matter in this day..
..he then will make a new zelda WITH MORE CARTOONY GRAPHICS AND MORE ABSURD STUFF FOR HIS LITTLE BOY becase FU that's why..
Farewell Epona... You've been replaced by the Master Cycle! Steampunk design x Zelda... part of me is intrigued. It could end up being too much like modern Final Fantasy games, which I'd hate to see. But I'm at least open minded to the idea..
Hmm...given some of what I saw in the Zelda WiiU teaser, I don't think that would be unfitting! Bring it on, I say! I think it looks awesome, and I can see Link zooming around with it someday in a futuristic Zelda! What's its real name though: Master cycle or Triforcer? "I really like the HW cut-scenes though so I wouldn't be opposed Zelda has always had really well done emotive scenes but something about HW struck a chord with me"
I like the HW cutscenes too, but I don't think they are miles better then regular Zelda's cutscenes. The cutscenes from the regular Zelda's are also pretty good, probably even better. Is this the picture of your new game? Zelda series are usually set long after technology has faded. Me gusta tanto el deporte de la bici y el Ciclo Maestro. Did Best Buy Leak Joker's Render For Smash Bros. Ultimate Ahead Of Schedule?